The Classic Screen with Sound Transmission! Standard matte-white perforated front projection screen for theatre, event, home cinema and movie theatre applications. Perforated for sound transmission. The OPERA® WHITE PERFORATED front projection screen is the same as the OPERA WHITE, but with perforation for sound transmission. OPERA® WHITE PERFORATED is often used in cinemas and in home cinemas, since loudspeakers can be placed behind the projection screen without muffling the sound or disturbing the screen surface. 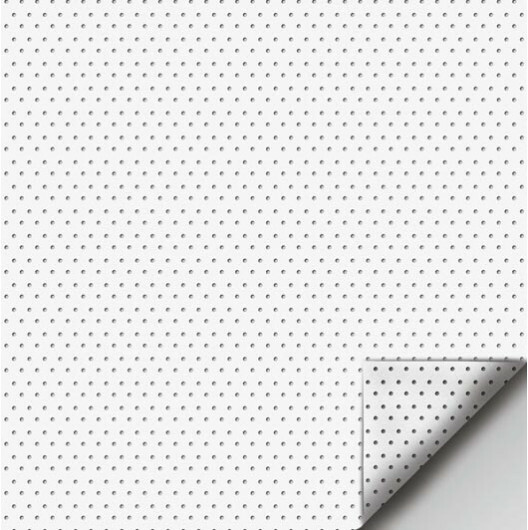 With a perforation of 57,000 holes per square meter (37 holes per square inch), a perforation diameter of 1.25 mm and approximately 7 % perforation area, the OPERA® WHITE PERFORATED screens appear as a solid surface with just a few meters of viewing distance. For shorter viewing distances, we recommend a microperforated screen. Packing method running meters: generally rolled. Delivery of manufactured curtains or screens: generally folded, on request rolled. We manufacture custom projection screens to customer specifications to nearly any shape and size.